Stretch marks are appeared on the abdominal area while during the period of pregnancy. It is because of continues itching on abdomen which is extremely unbearable. So here are the most recommended home remedies to remove pregnancy marks and also avoid the marks by making your own moisturizers. Usually stretch marks appear after the pregnancy in women. It is may be the cause of hormonal changes, fat loss in the abdomen after delivery, loosing elasticity of skin and others. Stretch marks are just like the fine lines that are developed around the areas where the fat is accumulated. The other areas like stomach, chest, belly bottom and thighs are also affected. 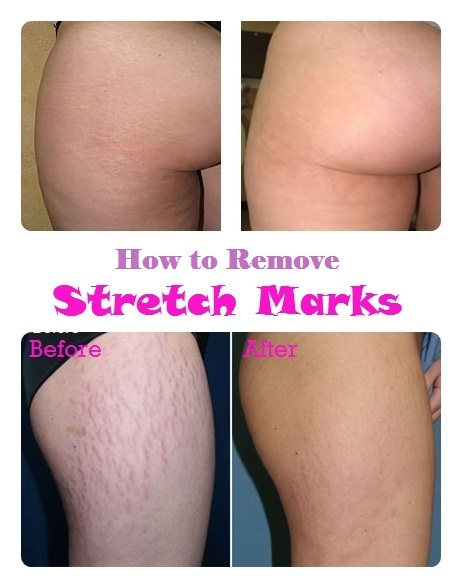 Stretch marks can be removed gradually. The marks will not be vanished instantly or quickly. You need some patience while doing the treatment at home. There are many treatments of getting rid of stretch marks like surgical treatments, creams, lotions. The surgical treatments are expensive and do not give the effective results. So it is better to use useful methods like using the natural herbs and ingredients due to which you should never come in complex that will harm you ever. The stretch marks should be treated as soon as you see the first line appear on your abdomen. There are also some suggestible remedies that you can try during the time of pregnancy. The first thing you should do is moisturizing the skin so it can remain hydrated. The more you keep your skin soft, the less will be your stretch marks. Olive Oil: The olive oil is very essential for removing stretch marks around your abdomen and belly bottom. Regular massaging the areas will leave your skin soft and avoid the stretch marks greatly. Make sure to take bath after applying the oil. You can also use vinegar and water using as night cream. Vitamin E Oil: It is also very useful for getting rid of stretch marks because it can be known as great moisturizer. Apply the vitamin E oil on the regular basis. Other Oils Treatments: The other types of oil are also advisable to use like coconut oil, almond oil, and avocado oil. Mix all of these oils together then apply on stretch marks regularly. Essential Oil Massage: The essential oils should be lavender, rose, germanium or other aroma oils that can be easily used as home remedy for reducing the stretch marks. Castor Oil: Apply castor oil on the desired areas then cover that with a plastic bag. Now place a hot water bottle on that area for about 40 minutes then wash off. The heat is given to the area because it allows the pores to absorb the oil easily. Aloe vera gel is reliable to use for skin problems and so for stretch marks too. Buy the gel from the market or you can squeeze out it from the fresh aloe vera leaf. Apply it over the affected areas daily. Aloe vera helps in healing the skin. Egg contains the rich source of protein and so it is very useful to use in stretch marks problem. The protein helps in rejuvenate the skin. Try the remedy on the regular basis and see the magic. Butter treatment is alike the oil treatment. Cocoa butter or Shea butter is considered to be the famous remedy for stretch marks. Apply these directly on the marks to reduce firmly. Butter improves the elasticity of the skin and protect it from dryness. Wash off after few minutes you have applied the butter. You should drink 12 glasses of water every day to keep your body hydrated. The hydrated skin can leave it from many skin problems. Remember not to drink coffee, tea or soda as they cause dehydration. Lemon juice also helps in eliminating the stretch marks because lemon is acidic in nature. Squeeze out the lemon juice and rub directly on the stretch marks. Leave it for some time so the juice can soak into your skin properly. Do this remedy daily for the better results. Take a medium-sized potato then cut in into two-halves. Now with one piece, rub on the stretch marks. The juice will soak into your skin. Add 1tsp of sugar in few drops of lemon juice and small amount of almond oil. Apply the mixture on your stretch marks as this scrub can help in exfoliating the dead skin cells. Do the remedy every day before taking bath. Now I am showing you Homemade Moisturizer, Homemade Lotion and Homemade Cream for treating all types of stretch marks on your body. Here are the simplest recipes for you. Now it is easy to make your own home made moisturizer. All you need is wheat germ oil, olive oil and aloe vera in equal parts. Use it as daily moisturizer for applying on stretch marks. Mix ¼ cup of aloe vera gel with ½ cup extra virgin oil. Take 6 vitamin E capsules and 3-4 vitamin A capsules and break them, add the liquid to the oil and gel mixture. Mix all the ingredients well then pour it in a bottle or jar and store in a cool place such as refrigerator. The natural stretch removing lotion is ready. Apply daily on the stretch marks, shake well before use. Take ½ cup of cocoa butter, 1 tbsp of vitamin E oil, 2 tbsp of bees wax grated and mix them properly. Now add wheat germ oil and apricot kernel oil in it and mix them also. Now heat the mixture so as the wax could be melt. Store it in a refrigerator. This is your homemade stretch marks removal cream. Apply the cream on the affected areas. We could also try not to have stretch marks during pregnancy. Here are some tips due to which you can understand that how you can avoid stretch marks from happening. Maintain the healthy lifestyle which includes vitamin C, vitamin E and proteins. These help in collagen production, improve elasticity of your skin and help in repairing the tissue and growth. Drink lots of water to keep your skin hydrated. You should also drink black, green or white tea as it is rich in anti-oxidant. Keep yourself physically active and try to work time by time so as to keep the blood circulation rejuvenated. During pregnancy, before taking bath, always remember to massage your whole body with aroma oil. This helps in reducing the stretch marks after pregnancy. Rub the cream “Vaseline intensive care” on stomach daily during pregnancy. Do a regular massage on the affected areas to make your skin exfoliated like on stomach, thighs, chest with the oils. It helps in enhancing the elasticity of the epidermis.